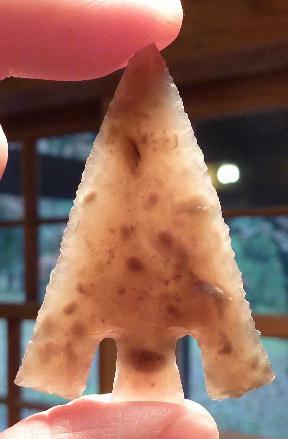 I make a lot of these points from Nordic, and British flints as well as other foreign flints and some American materials that resemble them. A lot of it is odd leftovers from dagger manufacture. Not to be wasted, it goes into these very popular pieces! These come in two main types: tanged and barbed "Beaker Points" associated with the Bell Beaker Cultures of Northwest Europe [circa 2500 BC,] and "Hollow Base" points that are mostly associated with the Late Neolithic and Early Bronze Age [2400 - 1500 BC.] These have a wide distribution from North Europe to Egypt.